Members trekking in to Nylam. Photo Grace McDonald. Please view our new Shishapangma Basecamp Trek video clips. 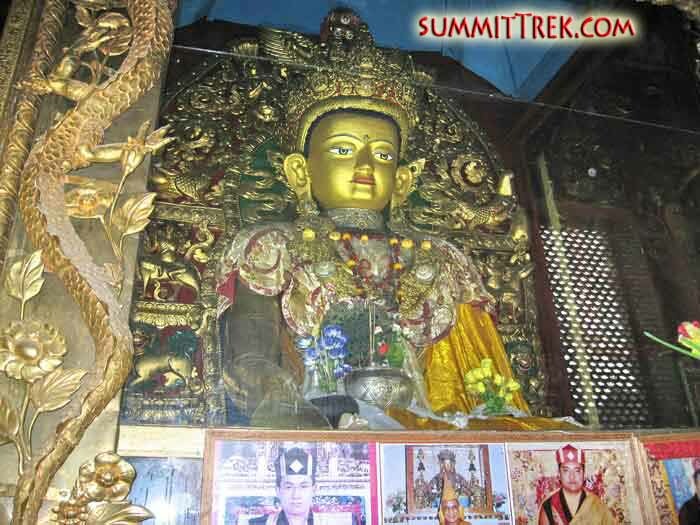 Trek to Shishapangma, the world's 14th highest 8000 metre/26,200 foot peak. Witness an international Shishapangma climbing expedition firsthand. 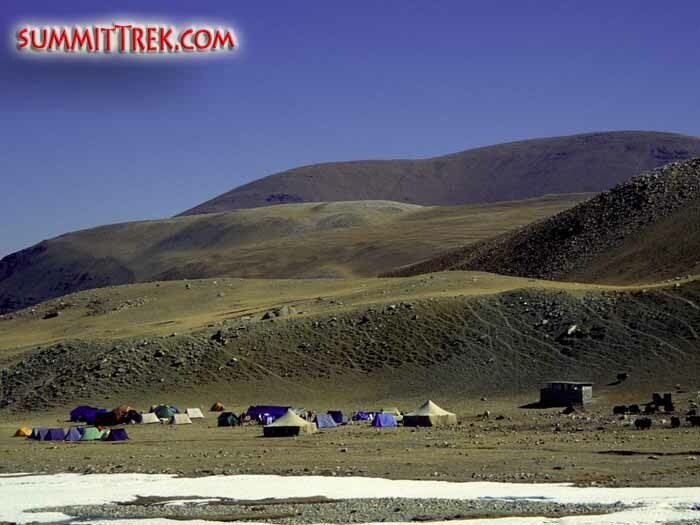 Walk to advanced basecamp on good snow-free trails, great high altitude trekking. 30 August to 16 September 2019 or 5 April to 22 April 20. 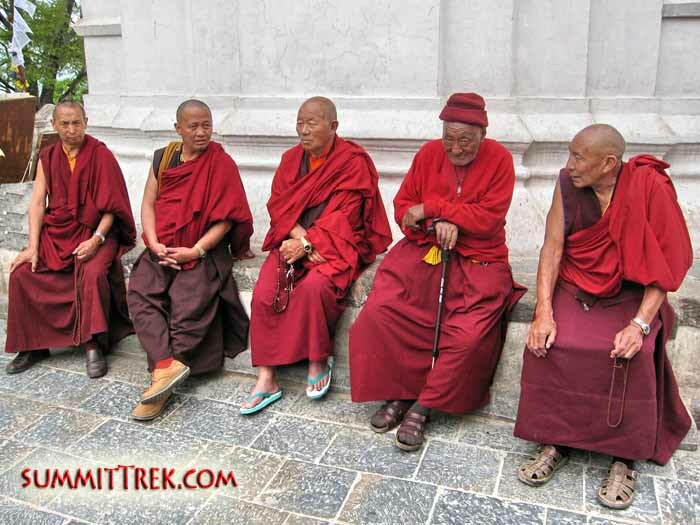 18 days in Tibet and Nepal. Recent News: Our Autumn Shisha Pangma Trek has just returned from the mountains and it was a huge success. Click here to read news of our expedition, listen to audio dispatches, and view recent photos of the walk. Please click one of the links below to view that section of our introductory information or just scroll down (photo right by Dan Mazur: The trail to advanced basecamp at 5400 metres/17,700 feet). Introduction: Shisha Pangma, known in Tibetan as "the god of the grasslands", is the lowest of the world's fourteen 8000 metre peaks. 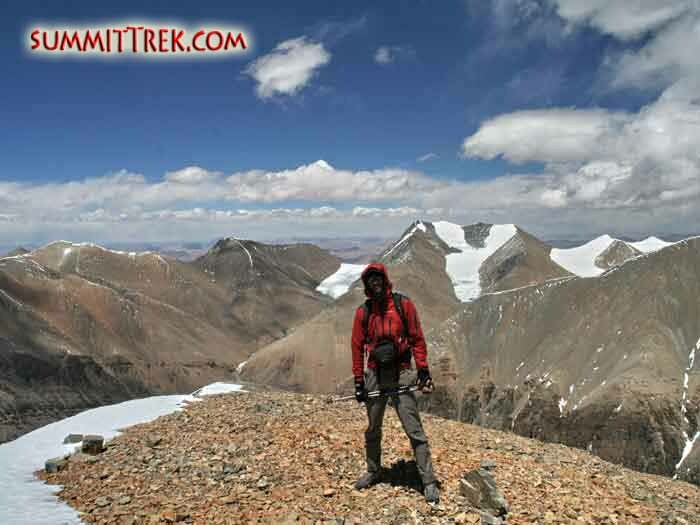 It is also the only 8000-meter peak located wholly in Tibet. 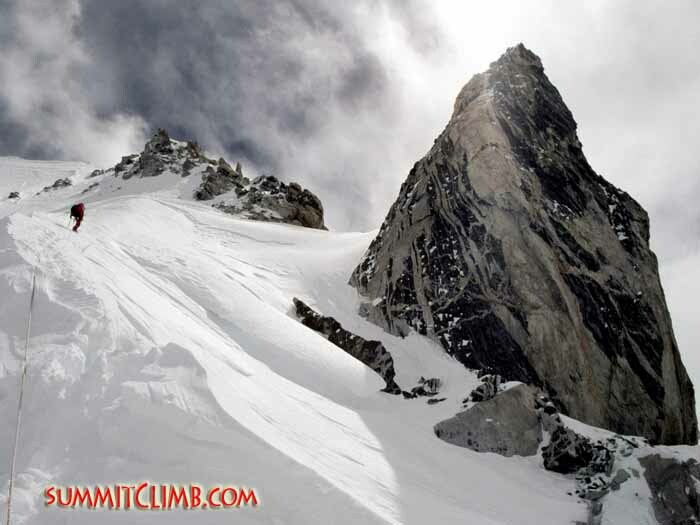 After an early attempt, it was first climbed in 1964 by a Tibetan-Chinese expedition and was opened to foreign climbers in 1978. The peak originally carried a Hindustani name: Gosainthan. Our trek to the base of the world's fourteenth highest mountain allows you to enjoy the incredible beauty of the Tibetan Plateau, and walk to a very high altitude on good snow-free trails providing stunning views of surrounding high peaks of the Himalaya (photo right by Dan Mazur: The view of Shishapangma near basecamp, 14th highest mountain in the world). Our comfortable basecamp and ABC: We have comfortable, heated dining tents with tables and chairs where our cooks and waiters will serve you delicious meals (photo right by Sam Mansikka: Our friendly and helpful staff of sherpas, cooks, and porters. They carry all of your personal equipment, group equipment, and set up camp each day, prepare and serve delicious meals, so you can relax and enjoy the trip). Shishapangma National Park: The park is situated among rolling, vast green short-grass and boulder strewn valleys leading up to the base of the mountain. The environment is beautiful and stark, inhabited with wild birds and animals. 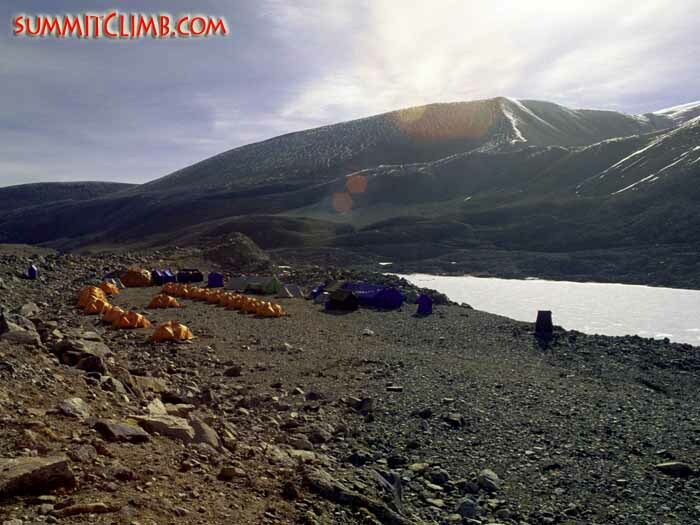 Upon reaching basecamp, you trek towards the mountain, where the vegetation changes to become more alpine and rocky, with the mountain looming upwards and provides great views of the vast Tibetan plateaus and two of Tibets most famous sacred lakes. Plants in the park range from spruce, pine, a wide variety of evergreen trees, as well as coldbelt grasslands. Many precious animals inhabit Tibet, such as antelope, deer, fox, gazelles, yaks, and many species of birds (Photo right by Jon Otto: Tibetan gazelles abound in the grassy valleys around basecamp). 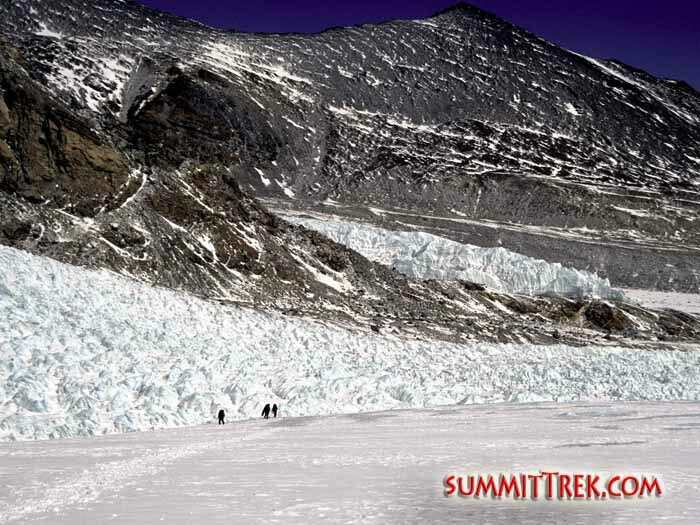 Trek to advanced basecamp: A beautiful trek to the base of the 14th highest peak in the world. This trek is very accomplishable by the average person who enjoys walking. Normally, you never step on snow and there is no climbing, only walking on moraine trails. 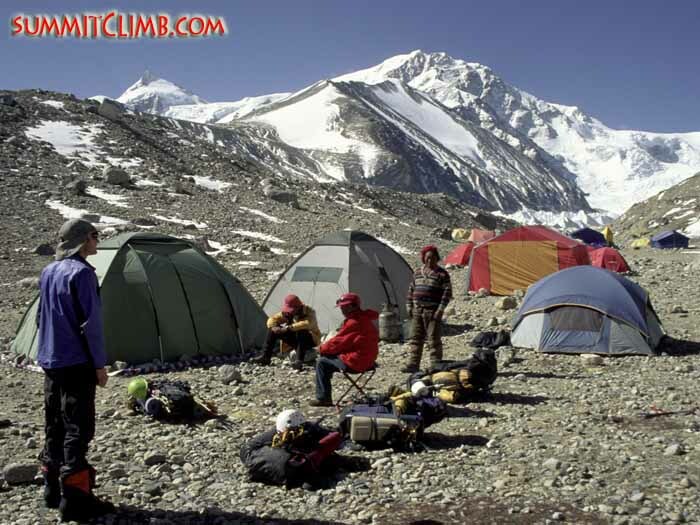 Advanced basecamp is located at 5400 metres/17,700 feet on the north foot of the mountain. 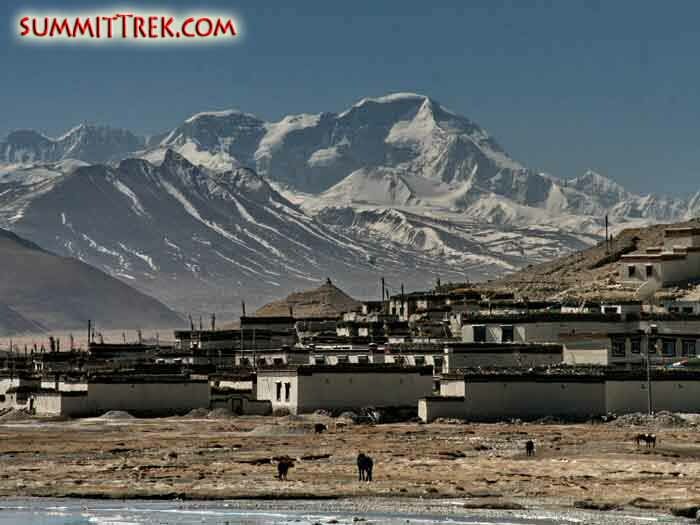 This is a spectacular view of Tingri, the last town we stay in before heading to basecamp. In the background you can see Cho Oyu, the world's 6th highest mountain (Tunc Findik). One of our team members taking a short hike above Chinese basecamp. On our rest days along the trek, we will have plenty of time to trek and explore the surrounding Tibetan plateau and get spectacular views of the Himalaya all around us. The pace allows you to do as little or as much hiking as you feel comfortable with, as you slowly acclimate to the rising altitude before setting out to ABC (Tunc Findik). 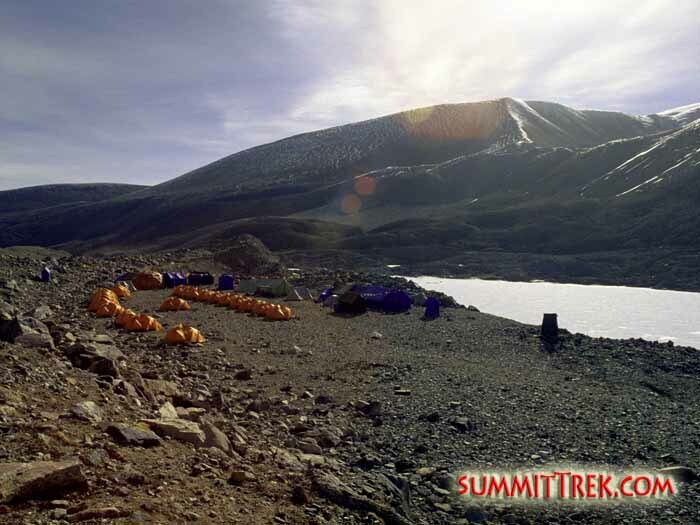 Our interim camp at about 5200 metres/17,000 feet. Our team is about halfway between basecamp and ABC (Dan Mazur). It would be nice if you have some experience with foreign travel, although we are happy to advise and help you if this is your first time out of the country and, for many of our members, it is (photo right by Dan Mazur: Our team in ABC). 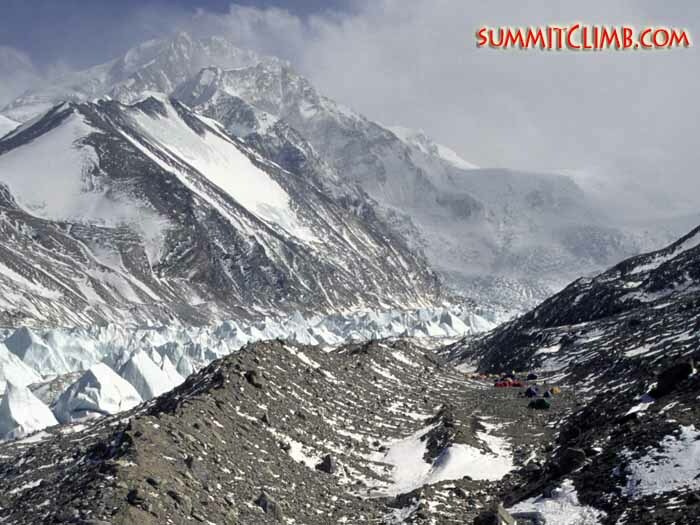 Please "click" one of the links on the column on the upper right of your screen under "Shishapangma Basecamp Trek" to learn more about our expedition. Tibetan-English Speaking Guides for the Group: (we are also able to provide Tibetan French and German speakers). 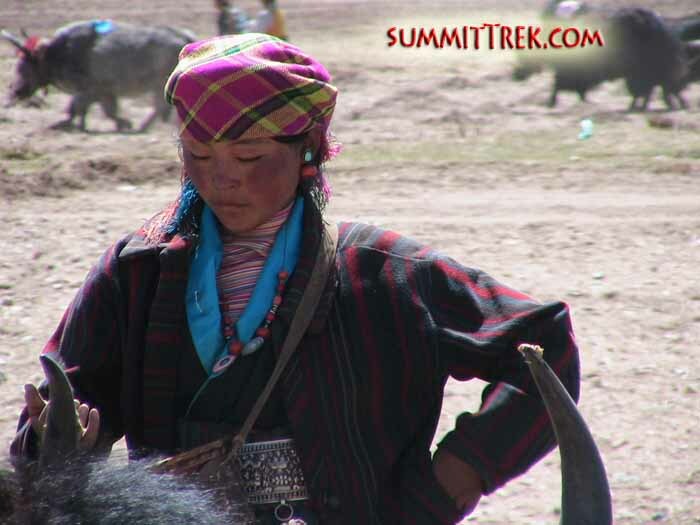 Our trained guides will explain everything in extensive and historical/geographical detail to you, as they lead you on your trek and explain the goings-on as you drive through villages, trek to the base of Shishapangma, and through the Tibetan plateau. 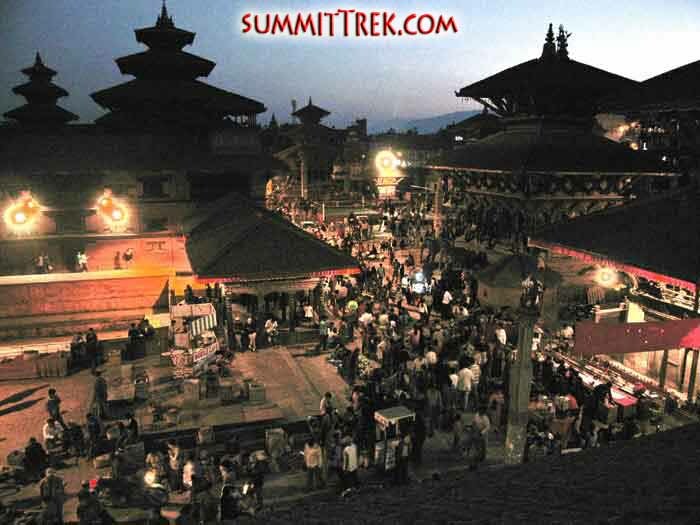 Sherpas and Equipment Transport: Our trek includes transport of all of your equipment from Kathmandu to advanced basecamp, and returned to Kathmandu. While trekking, we DO NOT ask our full-service members to carry a heavy rucksack. We employ employ local herders and their yaks to carry your personal items, group equipment and supplies (photo right by Samuli Mansikka: Our friendly and helpful staff of sherpas, cooks, and porters. They carry all of your personal equipment, group equipment, and set up camp each day, prepare and serve delicious meals, so you can relax and enjoy the trip). 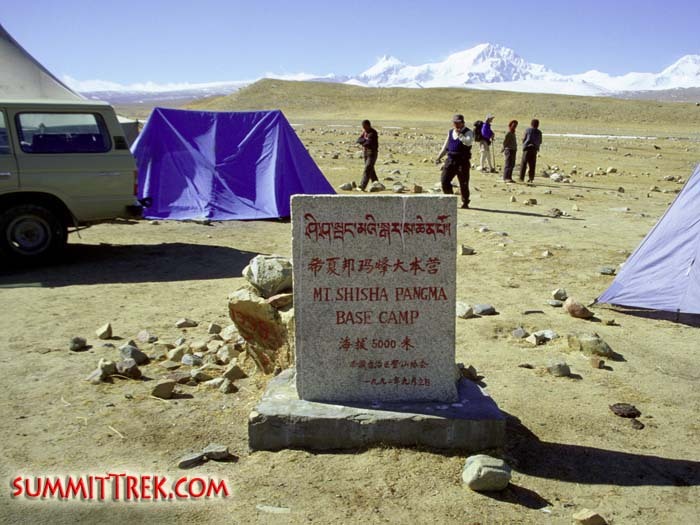 Please click one of the links below to view that section of our Shishapangma Basecamp Trek daily itinerary or scroll down. Please also visit our Shishapangma Basecamp Trek route description for more about what to expect on the drive from Kathmandu, during the trek itself, etcetera. 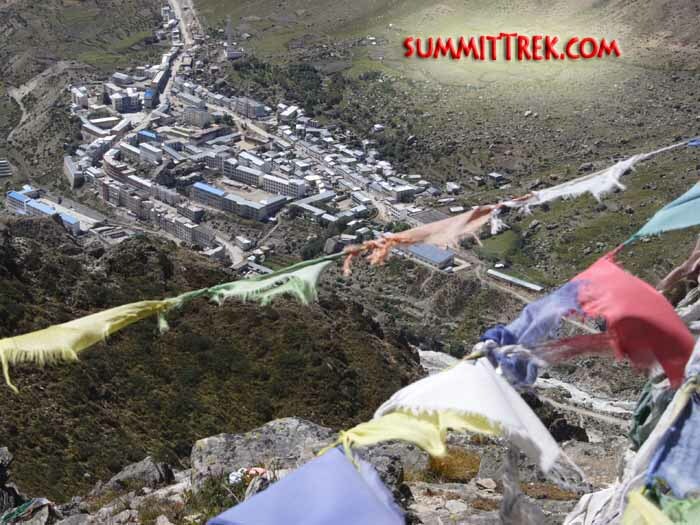 Please click one of the links below to view that section the route for the Shishapangma Basecamp Trek, or scroll down. Shisha Pangma, known in Tibetan as "the god of the grasslands", is the lowest of the world's fourteen 8000 metre peaks. 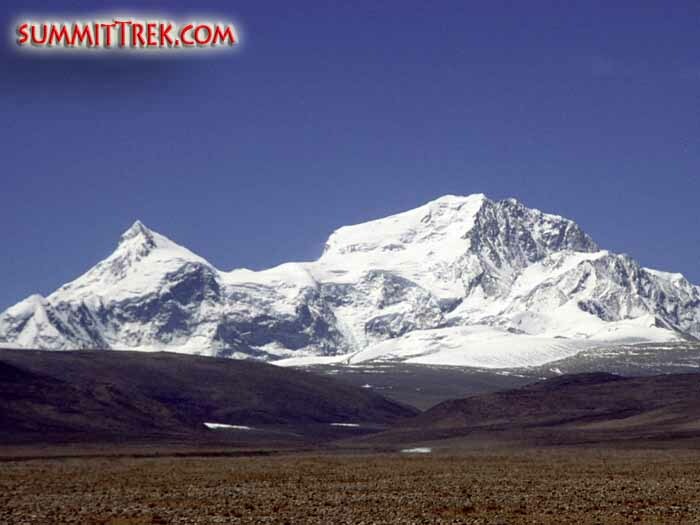 It is also the only 8000-meter peak located wholly in Tibet. 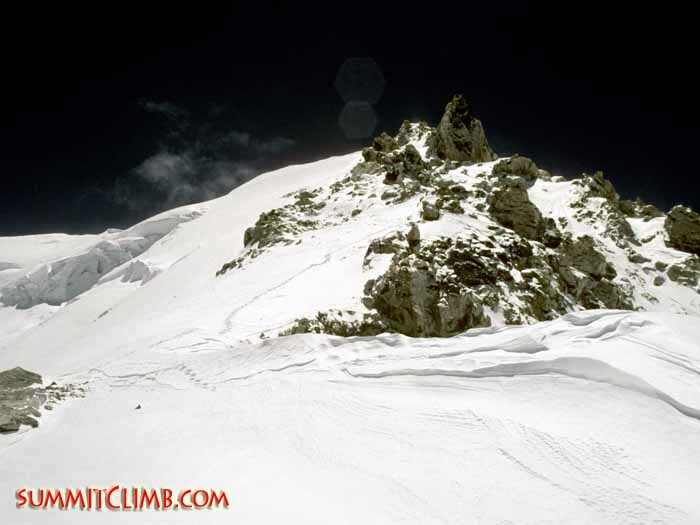 After an early attempt, it was first climbed in 1964 by a Tibetan-Chinese expedition and was opened to foreign climbers in 1978. The peak originally carried a Hindustani name: Gosainthan. Our trek to the base of the world's fourteenth highest mountain allows you to enjoy the incredible beauty of the Tibetan Plateau, and walk to a very high altitude on good snow-free trails providing stunning views of surrounding high peaks of the Himalaya (photo right by Dan Mazur: The view of Shishapangma near basecamp, 14th highest mountain in the world). 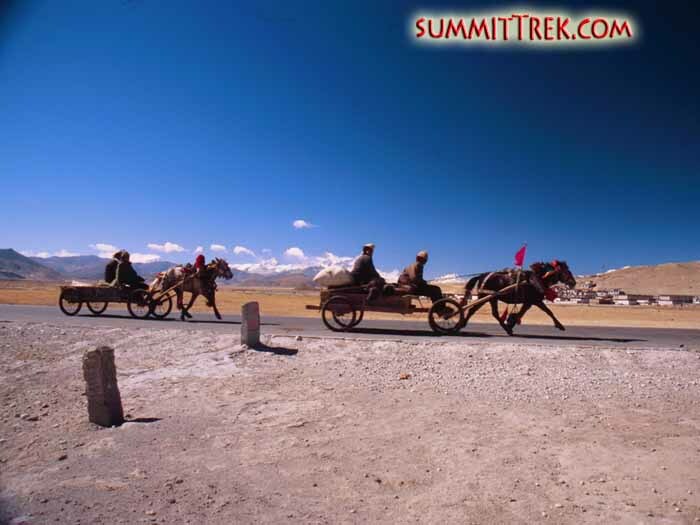 The proposed itinerary allows enough time for proper acclimatization, rest days to explore the Tibetan plateau, and enjoyable stops along the way to basecamp for experiencing Tibetan culture. The weather at this time of year is normally quite good and stable. Early in the morning you set out in a bus for the last Nepal town of Kodari at 1,770 meters/5,800 feet. If you are concerned about the altitude and have purchased Diamox (acetylzolamide), which is inexpensively available with no doctor's prescription in Kathmandu, this might be the time to begin taking it. For more information about Diamox, please click here (photo right by Tunc Findik: This is a spectacular view of Tingri, the last town we stay in before heading to basecamp. In the background you can see Cho Oyu, the world's 6th highest mountain). You clear Nepalese customs and immigration, then hire local porters and vehicles to carry your bags across the Bota Kosi River on the Friendship Bridge, to Zhangmu, the gateway town in Tibet. Upon entering Tibet, the clocks immediately go forward by 2 ¼ hours. Your liaison officer will meet you in Zhangmu. After clearing Tibetan customs and immigration, a Chinese bus takes you up the windy road through the rolling hills to Nyalam town at 3,750 meters/12,400 feet, and a basic "hotel". The smaller towns in Tibet are generally simple and rustic places, and this one is no exception. A stop along the road near Tingri. There are simple developed hot springs here (Bruce Manning). Vehicles drop us at 4600 metres/15,000 feet. It's a short walk to basecamp (sinclair, hume, pappenfus collection). Yaks taking us to ABC at 5400 metres/17,700 feet (Roland DeBare). 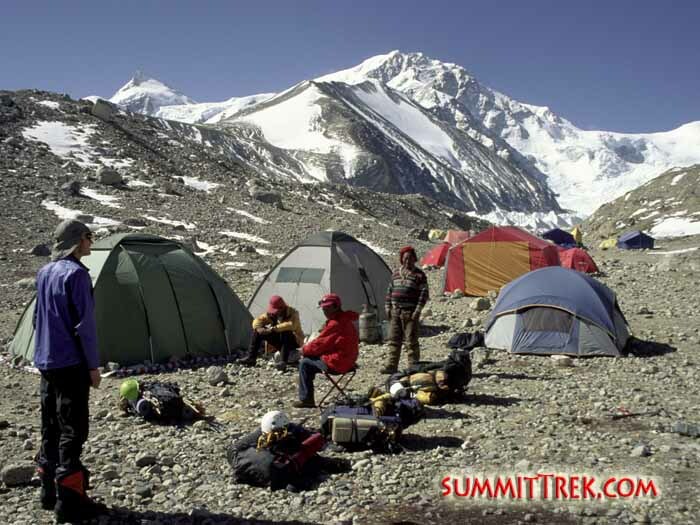 You then spend two days moving up to the "advanced basecamp" at 5400 metres/17,700 feet. 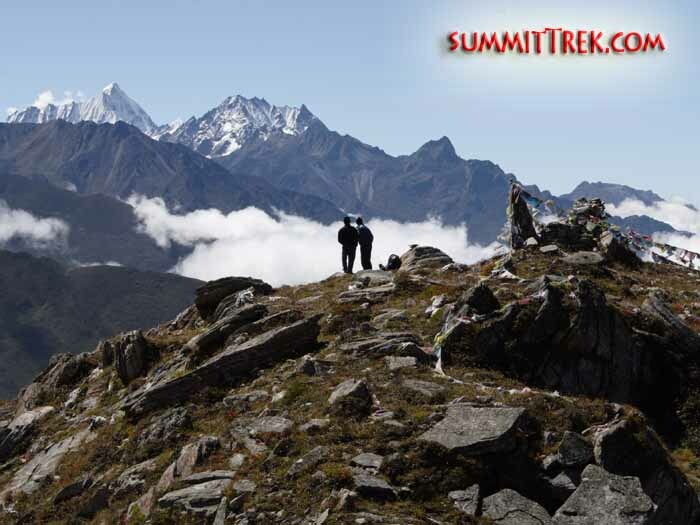 It is a beautiful trek to the base of the 14th highest peak in the world. This trek is very accomplishable by the average person who enjoys walking. Normally, you never step on snow and there is no climbing, only walking on moraine trails. Advanced basecamp is located on the north foot of the mountain. Advanced base camp lies on the north foot of the mountain at 5400 metres/17,700 feet (sinclair, hume, pappenfus collection). Our interim camp at about 5200 metres/17,000 feet. Our team is about halfway between basecamp and ABC (Dan Mazur). Our team in advanced basecamp (Dan mazur). Thank You for joining our Shishapangma Basecamp Trek. Leadership: During this full-service expedition, you will benefit from the leadership provided by Dan Mazur (photo by Aldas Baltutis). Sherpas: We hire Sherpas and high altitude porters in a support capacity, and now have 23 of these very experienced, friendly, strong, helpful, and loyal people on our staff, including some of Nepal's best climbers and some of Nepal's only women Sherpas. 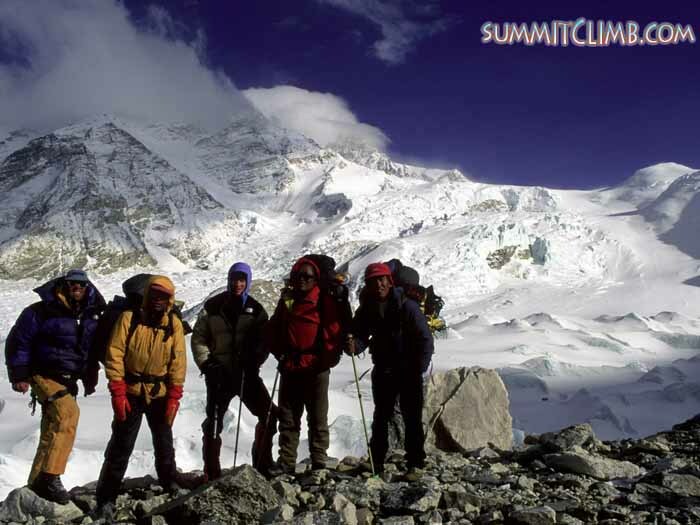 Some of our Sherpas have been to the summit of Shishapangma more than 7 times and led treks to Shishapangma Basecamp, Everest Basecamp and overland Tibet tours countless times. One of our lady sherpas just became the first Nepalese woman to reach the summit of Ama Dablam, Pumori, and Cho Oyu. Many of our sherpas have personally assisted foreign climbers to the summits of more than ten of the highest peaks in the Himalaya, as well as to many remote and unique trekking destinations (photo right by Sam Mansikka: Our friendly and helpful staff of sherpas, cooks, and porters. They carry all of your personal equipment, group equipment, and set up camp each day, prepare and serve delicious meals, so you can relax and enjoy the trip). Extensive experience is not required for trekking to Shisha Pangma basecamp. The most important thing is for members to be in adequate walking fitness. We hope that you will arrive for your Shishapangma Basecamp Trek in good health, both mentally and physically prepared, so we can work together as a team and have a successful expedition. Please go to our personal & team equipment section of the "Shishapangma Basecamp Trek Questions" for additional information and detailed discussion of the equipment lists below. Please fill out our online request information form. Please be sure and tell us which expeditions and treks you are interested in and mention your experience, qualifications, etcetera. Please send us your email, postal address, and telephone number (which will remain absolutely confidential, we never share your addresses, phone numbers, or any personal details). 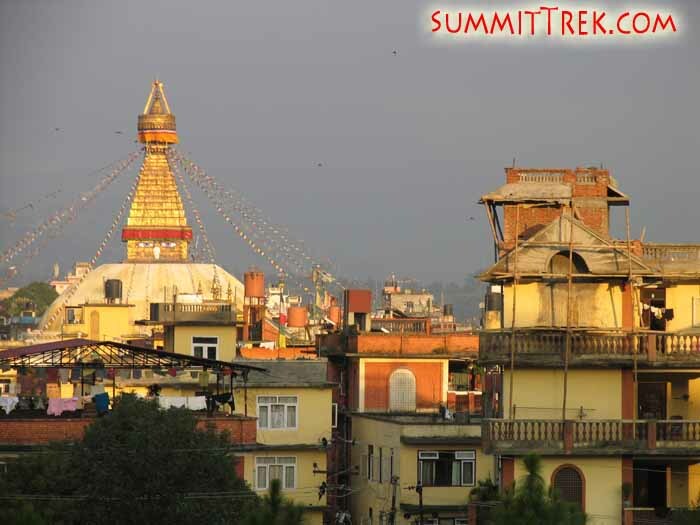 Your Nepal visa is conveniently purchased by you upon arrival at the Kathmandu airport. It is not necessary to purchase a Nepalese visa prior to landing in Nepal. In 2008, the cost of a 60 day visa was $40 USD. We recommend getting a 60 day double-entry Nepal visa upon arrival at the airport in Kathmandu instead of the normal single entry visa. When reentering Nepal upon your return from Tibet at the end of the trip you won't have to purchase a new visa. Please bring cash and 2 extra passport-sized photos (extra photos are necessary to obtain the visa in the airport). Because the expedition is in Tibet, we provide special support to you in Kathmandu in organizing your Tibet-China visa. Be ready to pay up to $220 USD (US citizens) and $135 USD (non-US citizens) for your Tibetan visa. It may be cheaper, but we will tell you and provide a receipt. Thank you. Please click here to view our Shishapangma Basecamp Trek leadership page for more about our leader, organizer, sherpas, and staff. Our very loyal and hard-working staff are made up of porters, yak-drivers, guides, basecamp managers, wait staff, kitchen assistants, cooks, high-altitude porters, high-altitude climbing-sherpas, bus, truck, and jeep drivers, local agents, tour-operators, and government liaison officers and ministry officials. Please click here to view our Shishapangma Basecamp Trek leadership page for more about our leader, organizer, sherpas, and staff. Please see the Equipment link, to study what is needed. If you are not familiar with the necessary equipment, we suggest you attend one of our Glacier Schools, to learn about it and buy it affordably . Please visit the medical section of the Shishapangma Basecamp Trek Personal & Team Equipment link to view a full list of the medicines we recommend you purchase inexpensively in Kathmandu, without a doctor's prescription, before departing for the mountain. For information about using your credit, bank, cash, ATM card in Nepal & Tibet, please "click here". 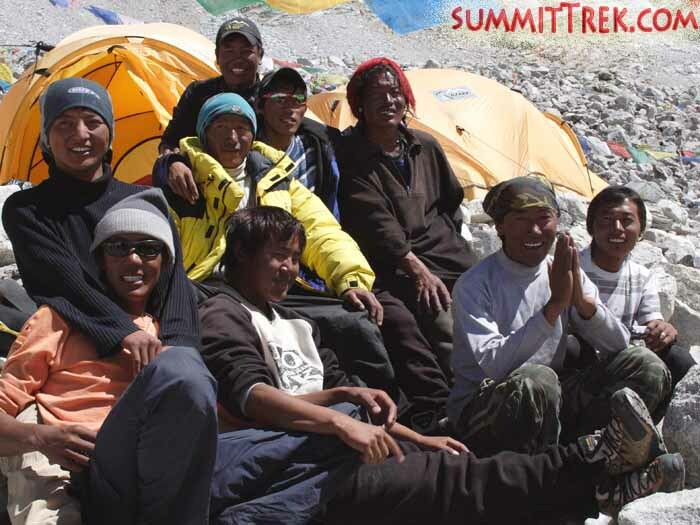 For more information about how much cash to bring for a Shishapangma Basecamp Trek, please "click here". Your trip includes 2 free Kathmandu hotel nights at the beginning and two free Kathmandu hotel nights at the end of the trip. You will be sharing. If you do not wish to share, you can pay an extra $20 for a single room (during any of the included 4 nights). If you want a room for extra nights, outside of the included 4 nights, the price will be $30 (single room). Price includes good delicious breakfast and mandatory 25% Nepal government tax and government service charge. Please bring extra cash to pay for your extra nights and / or your single supplement. We often stay at the comfortable three star Hotel Shakti. Its an excellent and classic hotel surrounded by green gardens and located in the heart of the city action near many delicious restaurants, the city's best mountain equipment shopping, and abundant nightlife all within a few minutes walk. The Shakti also offers lots of entertaining day trip (and night outing) options such as city tours, walking tours, rock climbing, mountain biking, wild game safaris, horse back riding, art classes, volunteer opportunities at orphanages, hospitals, schools, women's centres, bird watching, cooking classes, sport fishing, day peak climbing, herbal medicine seminars, day hikes, pottery classes, car tours, sightseeing, temple tours, henna handpainting classes, massage, swimming, beauty salon, motorbiking, yoga retreats, river rafting, painting classes, golf, language courses, kayaking, writing seminars, bungie jumping, religious worship, canyoning, hot tubs, health club, saunas, fitness center, spa treatments, Mount Kailash Treks, night clubs, meditation retreats, gourmet restaurants, cultural dance performances, wine tasting, pedicures and manicures, casino gambling, barber shop, discotheques, airport transfers, Scenic flights around Mount Everest and much much more. Meals in Kathmandu are at your expense. Many members do labring their ptop, ipod, mp3 player, and/or digital camera. 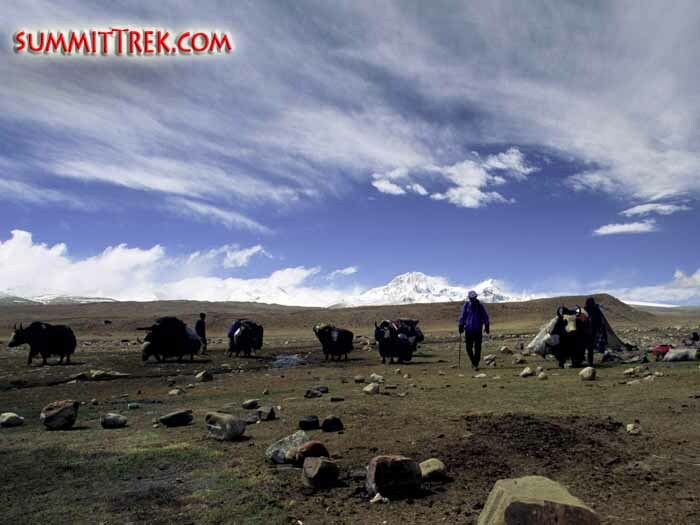 Below are some short video clips taken from our recent Shishapangma Basecamp Trek. Please click the picture or title in the left column to view each clip. In the right column is the description for each video. A look at our comfortable advanced basecamp, located at 5400 metres/17,700 feet on the north foot of the mountain (Sean Burch). 1:10 minutes (10 MB). Our comfortable base camp at 5000 metres/16,400 feet (Sean Burch). 0:25 seconds (4 MB). A view of the vast Tibetan plateau and the surrounding Himalayan Giants, including Shishapangma (Sean Burch). 0:35 seconds (5 MB). Mountain View A view up the mountain from ABC of the route to the summit (Sean Burch). 1:20 minutes (11.5 MB). 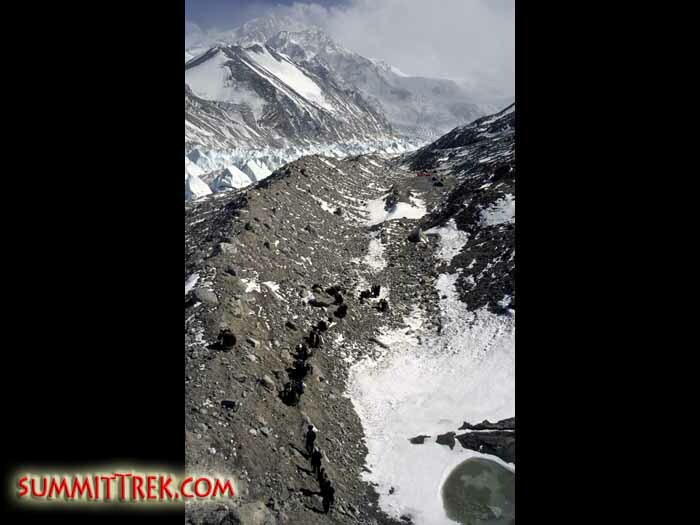 The ice-fall that climbers cross through before reaching camp 1. 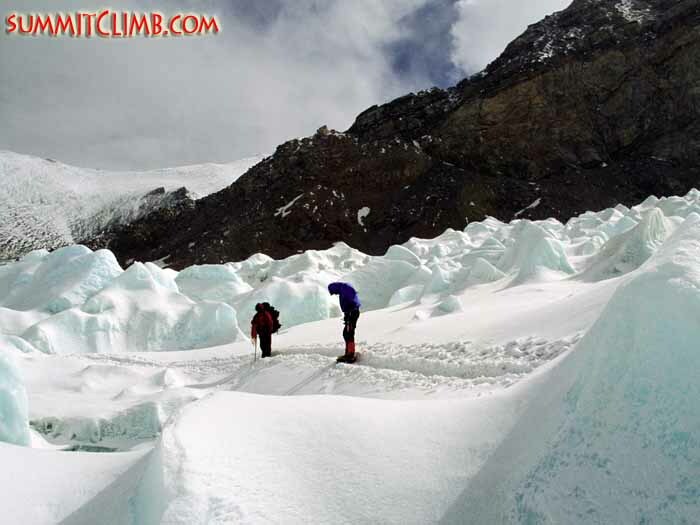 From ABC the glacier extends to a flat area with many serac formations that trekkers may wish to explore (Sean Burch). 0:50 seconds (7 MB). The drive from Kathmandu (Tim Boelter). 0:45 seconds (6.5 MB). 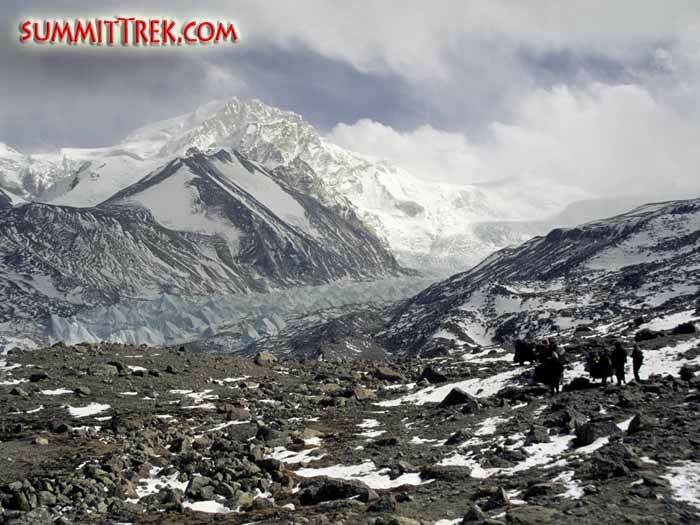 We will be expanding with more Shishapangma Basecamp Trek video clips. Climbing near the Gendarmes on our summit attempt at around 7600 metres/25,000 feet (Dan Mazur). 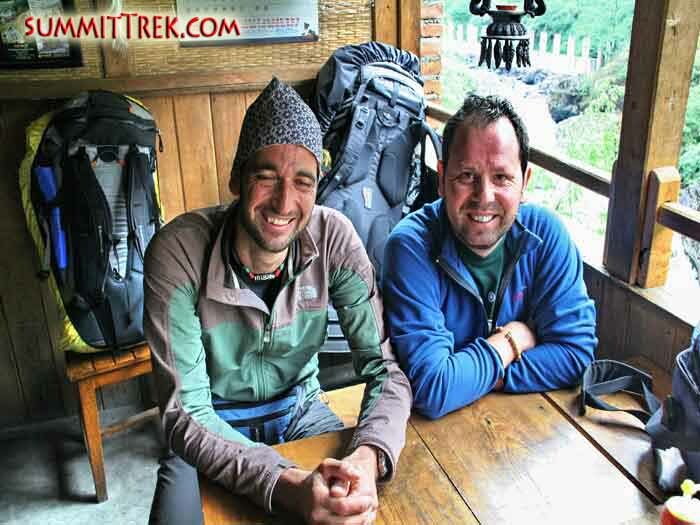 Thank you for reading about our past Shishapangma Expeditions/Treks. To follow along with our ongoing trips around the world, please view our "Recent News" section. What questions do you have? Please ask as many questions as possible. This helps us to have a proper conversation so we can better understand one-another's expectations, so you will have a very safe, enjoyable, and successful trek. Thank you. Before completing the application forms, please be sure to carefully study the Shishapangma Trek "Questions" website for information regarding flights, payment, team members, application forms, insurance, etcetera: Shishapangma Trek Frequently Asked Questions. What questions do you have? Please ask as many questions as possible. This helps us to have a proper conversation so we can better understand one-another's expectations, so you will have a very safe, enjoyable, and successful trek. Thank you. Before completing the application forms, please be sure to carefully study the Shishapangma Basecamp Trek "Questions" website for information regarding flights, payment, team members, application forms, insurance, etcetera: Shishapangma Trek Frequently Asked Questions.